SKITTLES, THE REGENCY, WEDNESDAY 3RD APRIL 2019, 7 PM. £6 FOR MEAL. DARTS, THE REGENCY, WESTON-SUPER-MARE, WEDNESDAY 27TH MARCH 2019 7PM, £6 FOR MEAL. UNFORTUNATELY THIS EVENT HAS BEEN CANCELLED DUE TO A CUP MATCH AT THE REGENCY. I HAVE BOOKED DOMINOES AT THE YORK HOTEL. SAME ARRANGEMENTS EXCEPT FOR THE MEMBERS/ VOLUNTEERS WHO ORDERED CURRY. I’VE CHANGED THEIR ORDER TO FISH & CHIPS. THIS EVENT HAS BEEN CANCELLED DUE TO A CUP MATCH BEING HELD AT THE REGENCY. WE ARE NOW HOLDING A QUIZ AT THE EBDON ARMS, 7PM, FOOD £6. DOMINOES, WEDNESDAY 6TH FEBRUARY 2019, THE YORK HOTEL, 7 PM, £6 FOR MEAL. THAT'LL BE THE DAY, BRAND NEW CHRISTMAS SHOW, WEDNESDAY 12TH DECEMBER 2018, 7.30 PM, PLAYHOUSE WESTON-SUPER-MARE. CHRISTMAS PARTY, THE RED ADMIRAL, WESTON, FRIDAY 7TH DECEMBER 2018. 8PM. PARTY OUTFITS COMPULSORY! DOMINOES, THE YORK HOTEL, WESTON-SUPER-MARE, WEDNESDAY 14TH NOVEMBER 2018. 7PM, £6 FOR MEAL. SOME GUYS HAVE ALL THE LUCK, ROD STEWART TRIBUTE. SATURDAY 13TH OCTOBER 2018, 7.30 PM, PLAYHOUSE, WESTON-SUPER-MARE. SATURDAY NIGHT FEVER, BRISTOL HIPPODROME, SATURDAY 6TH OCTOBER 2018 2.30 PM. KARAOKE, THE RED ADMIRAL, FRIDAY 28TH SEPTEMBER 2018, 8 PM. BUFFET. QUIZ, EBDON ARMS, WICK ST. LAWRENCE, THURSDAY 27TH SEPTEMBER 2018, 7PM. QUIZ, EBDON ARMS, WICK ST. LAWRENCE, THURSDAY 27TH SEPTEMBER 2018. 7PM, £6 FOR MEAL. THIS IS A SPECIAL TRIP FOR MEMBERS AND VOLUNTEERS AS A BIG THANK YOU FOR YOUR LOYALTY AND SUPPORT OVER THE PAST YEARS. RAFT BUILDING & CANOEING, TUESDAY 21ST AUGUST 2018, HEWISH, WITH MENDIP OUTDOOR PURSUITS. AGM, THE REGENCY, WEDNESDAY 15TH AUGUST 2018. 2PM. BEING BRUNEL MUSEUM. SATURDAY 21ST JULY 2018. £10. ENTRY TO BEING BRUNEL IS INCLUDED IN THE ADMISSION PRICE FOR BRUNEL'S SS GREAT BRITAIN. THIS SHOULD BE AN AMAZING EXPERIENCE! RACE NIGHT, SATURDAY 7TH JULY 2018 8PM AT THE REGENCY, WESTON-SUPER-MARE. THIS IS A FUN NIGHT AND RAISES FUNDS FOR ENERGEYES SO PLEASE COME ALONG AND SHOW YOUR SUPPORT. 8PM. DOMINOES, THE YORK HOTEL, WEDNESDAY 4TH JULY 2018. 7PM, £6 FOR MEAL. 15 SEATS BOOKED, NO MORE AVILABLE. RACE NIGHT, SATURDAY 26TH MAY 2018, THE REGENCY, WESTON-SUPER-MARE. 8PM. THIS EVENT HAS BEEN CANCELLED AND IS NOW TO BE HELD ON SATURDAY 7TH JULY 2018. SATURDAY 12TH MAY 2018. BRINGING ON BACK THE 60'S, PLAYHOUSE, WESTON-SUPER-MARE. 7.30 PM. £10 MEMBERS, NON MEMBERS £21. THE MAYOR'S AWARD CEREMONY, SUNDAY 6TH MAY 2018 AT ST. PAUL'S CHURCH, WALLISCOAT ROAD, WESTON-SUPER-MARE. WE WILL BE USING A MINI BUS FOR THE TRIP 15 SEATS ONLY AVAILABLE. THIS IS A FUN NIGHT AND RAISES FUNDS FOR ENERGEYES. PLEASE COME ALONG, HAVE LOTS OF LAUGHS AND SUPPORT OUR CHARITY. THIS EVENT HAS BEEN CANCELLED DUE TO SEVERE WEATHER CONDITIONS. THE NEW DATE IS SATURDAY 26TH MAY 2018, 8PM. LET’S HOPE IT’S NOT SNOWING THEN!!! THIS EVENT HAS NOW BEEN RE-ARRANGED FOR SATURDAY 7TH JULY 2018. HOPEFULLY IT WILL GO AHEAD ON THIS NEW DATE – WATCH THIS SPACE!!! THE DATE HAS BEEN CHANGED DUE TO A CUP MATCH BEING PLAYED ON 24TH AT THIS VENUE. DARTS, THE REGENCY INN, WESTON-SUPER-MARE, 7PM. WEDNESDAY 6TH DECEMBER 2017. £5 FOR MEAL. CHRISTMAS PARTY, FRIDAY 1ST DECEMBER 2017. THE RED ADMIRAL PUB, WESTON-SUPER-MARE. 7PM. FREE!!! No need to wear our polo shirts, this is a party so bring our the santa hats, tinsel and glitter, that’s just the men!! VIENNESE STRAUSS CHRISTMAS GALA, SUNDAY 19TH NOVEMBER 2017. 7.30 PM. £10 FOR MEMBERS, NON-MEMBERS £24.50 . I’VE BOOKED 11 SEATS FOR THIS EVENT. CHRISTMAS FAYRE, THE ROYAL HOTEL, WESTON-SUPER-MARE, SATURDAY 18TH NOVEMBER 2017 10AM TO 3.30 PM. Please come and support EnergEyes at this very important fundraising event. We will be hosting our usual bottle stall – a raffle ticket costs only £1 and you are guaranteed a prize!!! Members, volunteers, friends, family, neighbours, colleagues at work, please start collecting full bottles NOW! We do so well with this raffle: last year my target was to collect 200 bottles, and we did it. Michelle also offered a lucky dip for the younger visitors and that was a huge success; she is already collection items to wrap for this year’s Fayre. Also on offer will be Snowmen and Snowwomen made from used toilet roll holders, and I’m sure this will be another profitable fund raiser. Michelle is very artistic: We are very lucky to have her as a volunteer and committee member. Jayne, who is also a committee member, is running a chocolate tombola and I’m sure this will be very popular. Last year we raised £230+, which is amazing! This year I am aiming even higher – 260? Between us I’m sure we can reach this target! 8TH NOVEMBER 2017. BINGO, THE YORK HOTEL, 7PM. £5 FOR MEAL. WAR HORSE, SATURDAY 4TH NOVEMBER 2017 BRISTOL HIPPODROME, 2.30 PM. £10, MEMBERS, NON-MEMBERS £62.50. DUE TO A CANCELLATION THERE ARE TWO TICKETS LEFT. THE ILLEGAL EAGLES, WESTON-SUPER-MARE PLAYHOUSE. WEDNESDAY 11TH OCTOBER 2017, 7.30 PM. MEMBERS £15, NON MEMBERS £25.50. I’VE BOOKED 13 SEATS FOR THIS EVENT. WELCOME TO THE HOUSE OF FUN, THE MADNESS MUSICAL. SATURDAY 2ND SEPTEMBER 2017 2.30 PM. WESTON PLAYHOUSE. THAT'LL BE THE DAY, THE PLAYHOUSE, WESTON-SUPER-MARE, SUNDAY 20TH AUGUST 2017. 7.30 PM. £10 MEMBERS, NON-MEMBERS £25.50. I’VE BOOKED 13 SEATS FOR THIS EVENT. ONE TICKET REMAINING. THE EBDON ARMS, LILAC WAY, WICK ST. LAWRENCE, BS22 9WE. BUFFET AND RAFFLE. SMART DRESS CODE. NOT POLO SHIRTS! ANNUAL GENERAL MEETING, WEDNESDAY 2ND AUGUST 2017, THE REGENCY INN, 22-24 LOWER CHURCH ROAD, WESTON-SUPER-MARE. 2PM. DREAMBOATS AND PETTICOATS, CLASSIC TRACKS FROM ROY ORBISON, THE SHADOWS, EDDIE COCHRAN AND MANY MORE. SATURDAY 29TH JULY 2017, BRISTOL HIPPODROME, 2.30 PM. CANCELLED, DUE TO FARM CLOSING. INSTEAD WE ARE GOING TO MINEHEAD WHICH IS ANOTHER 40 MINUTES ON THE STEAM TRAIN, WONDERFUL! I HAVE HAD TO INCREASE THE PRICE TO £15 MEMBERS, NON MEMBERS £16.50. 21ST JUNE 2017, DARTS THE REGENCY INN, WESTON, 7PM. £5 FOR MEAL. ST. FAGANS, THE NATIONAL MUSEUM OF WALES. THIS IS AN OPEN-AIR MUSEUM NEAR CARDIFF CHRONICLING THE HISTORY, CULTURE AND ARCHITECTURE OF THE WELSH PEOPLE. ONLY 14 SPACES AS WE ARE USING A MINI BUS. PACKED LUNCH. TIME TO BE ARRANGED. SATURDAY 3RD JUNE 2017. £20 FOR MEMBERS, £30 NON MEMBERS. CASINO NIGHT, THE ROYAL HOTEL, 7PM TO 10PM. BUFFET AND RAFFLE. THE EVENT HAS BEEN RE-ARRANGED FOR 5TH AUGUST 2017 AT A NEW VENUE. SEE DETAILS LOWER DOWN THIS PAGE. THIS IS DUE TO CIRCUMSTANCES BEYOND MY CONTROL. 31ST MAY 2017. SKITTLES, THE REGENCY INN, WESTON. 7PM, £5 FOR MEAL. ONLY 14 SPACES AS WE ARE USING A MINI BUS. PACKED LUNCH. TIME TO BE ARRANGED. 10TH MAY 2017, DARTS, THE REGENCY INN, WESTON. 7M, £5 FOR MEAL. BACKSTAGE TOUR, BRISTOL HIPPODROME, SATURDAY 15TH APRIL 2017. 10-11 AM, £5. SATURDAY 1ST APRIL, 2017. RACE NIGHT, THE REGENCY INN, WESTON. 8PM. NO MEAL. THIS IS A FUN EVENING, A HUGE FUNDRAISER FOR ENERGEYES SO PLEASE COME ALONG AND SUPPORT YOUR CHARITY. 29TH MARCH, BINGO, THE YORK HOTEL, WESTON. 7PM, £5 FOR MEAL. SATURDAY 11TH MARCH, BARN DANCE, ST. PETER'S CHURCH, BAYTREE ROAD, MILTON, WESTON. 7PM TO 10PM. £5 FOR TICKETS. BUFFET AND RAFFLE. JOIN US FOR A FUN NIGHT OF DANCING AND CHAT. FANCY DRESS OPTIONAL. THIS IS A FUND RAISER FOR ENERGEYES. PLEASE BRING ALONG FRIENDS AND FAMILY. Pottery at Carantoc Art with Penny Price, The Studio, 3 Locking Moor Road, Weston-super-Mare BS22 8PL, to the side of the Borough Arms. Every Friday 2pm until 3.30 pm, £8.50. Come along and play with the clay and have fun on the wheel! Be inventive and artistic. FRIDAY 16TH DECEMBER 2016, CINDERELLA, BRISTOL HIPPODROME. TORVIL AND DEAN ON STAGE & REAL PONIES. 7PM, TICKETS £18, AUDIO DESCRIBED. I HAVE THREE TICKETS AVAILABLE FOR THIS EVENT. Come along and have a fun evening blasting out some tunes! This is a fund raising event for EnergEyes. DJ Steve will be there too! PLEASE START COLLECTING BOTTLES AND MEMORABELIA FOR THIS FUNDRAISING EVENT. OUR TABLE IS LOCATED IN THE BAY WINDOW IN THE ROOM WHERE WE HELD OUR CASINO NIGHT. SISTER ACT, THE MUSICAL, BRISTOL HIPPODROME, SATURDAY 24TH SEPTEMBER 2016, 2.30 PM. TICKETS £16. I have booked fifteen seats at this price. If I need to purchase more tickets due to demand the price will increase. SUNDAY 28TH AUGUST 2016. LAST NIGHT AT THE PROMS, THE PLAYHOUSE, WESTON-SUPER-MARE, 7.30 PM. £24.50, NO DISCOUNT FOR THIS EVENT. BARN DANCE, SATURDAY 11TH JUNE 2016. ST. PETER'S CHURCH HALL, BAYTREE ROAD, MILTON, WESTON-SUPER-MARE, 7PM £10. TICKETS TO BE PURCHASED IN ADVANCE FROM AILEEN. Come along and join us for our Barn Dance, lots of fun and wonderful food. Fancy dress optional, please bring your own refreshments. Friends and family welcome, raffle prizes would be very much appreciated. WEDNESDAY 25TH MAY 2016. DARTS, THE REGENCY INN, WESTON. £5 FOR MEAL. VISIT TO GUIDE DOGS NATIONAL BREEDING CENTRE, BISHOP’S TACHBROOK, WARWICKSHIRE. SATURDAY 14TH MAY 2016. 30TH APRIL 2016. CASINO NIGHT, THE ROYAL HOTEL, WESTON 7PM UNTIL LATE. £5 FOR MEAL. THIS IS A NON GAMBLING EVENT. ROULETTE, BACKGAMMON AND CRAPS. BUFFET PROVIDED AND USE OF THE BAR. 23TH APRIL 2016. RACE NIGHT, THE REGENCY INN, WESTON-SUPER-MARE. 8PM. PLEASE COME ALONG AND SUPPORT THIS FUN FUNDRAISING EVENT FOR OUR CHARITY. QUIZ, THE YORK HOTEL, WESTON-SUPER-MARE. WEDNESDAY 30TH MARCH 2016. 7PM £5 FOR MEAL. SATURDAY 26TH MARCH 2016. MAMA MIA ON STAGE AT THE BRISTOL HIPPODROME. 2.30 PM, £15. SOLD OUT. 2ND MARCH 2016. BEETLE DRIVE AND A GAME OF DOMINOES, THE YORK HOTEL, WESTON-SUPER-MARE. 7PM £5 FOR MEAL. After a very successful Barn Dance last June I was asked to arrange another one within six months. So much fun and wonderful food. Fancy Dress optional, raffle prizes very much appreciated and please bring your own refreshments. Ask friends and family to support us please. The Arosfa Hotel is two building up from The Regency Inn, towards the High Street. CELEBRATE "A VERY VICTORIAN CHRISTMAS" AT TYNTESFIELD HOUSE. EXPERIENCE LIFE FOR THE FAMILY AND SERVANTS AS THEY PREPARE FOR CHRISTMAS. HELP THE SERVANTS PREPARE AND DECORATE THE HOUSE OR RELAX WITH THEM AND TALK OF A MYSTERIOUS CHAP FROM BAKER STREET IN LONDON WHO IS VISITING THIS CHRISTMAS. SATURDAY 12TH DECEMBER 2015. CHRISTMAS PARTY, FRIDAY 4TH DECEMBER 2015 TO BE HELD AT DULCI'S CAFE, BAKER STREET, WESTON-SUPER-MARE. 7PM. BRING YOUR OWN REFRESHMENTS PLEASE. COME ALONG AND SUPPORT OUR CHARITY BY VOLUNTEERING TO HELP OUT ON THE DAY. WE ARE HAVING TWO TABLES IN THE PRINCE CONSORT ROOM, EVERYONE A WINNER BOTTLE STALL, BRIC-A-BRAC, ETC. Quiz, The York Hotel, Weston-Super-Mare, 6.30 pm 21st October 2015. £5 for meal. Beetle Drive, The York Hotel, Weston-Super-Mare 6.30 pm. Wednesday 14th October 2015. £5 for meal. Come along and draw your own special beetle! SATURDAY 10TH OCTOBER 2015. VISIT TO SS GREAT BRITAIN, BRISTOL. £5. WEDNESDAY 23RD SEPTEMBER 2015. SKITTLES, THE REGENCY INN, WESTON-SUPER-MARE. 7PM. £5 FOR MEAL. WEDNESDAY 16TH SEPTEMBER 2015. DARTS, THE REGENCY INN, WESTON-SUPER-MARE. 7PM £5 FOR MEAL. This is a local National Trust property. Beautiful rooms and very informative guides in each room. Beautiful, large gardens. Motorised buggy available for hire with prior notice. We will be taking a packed lunch for this trip. WEDNESDAY 2ND SEPTEMBER 2015. BINGO, THE YORK HOTEL, WESTON-SUPER-MARE. 6.30 PM. £5 FOR MEAL, £3 BINGO - THERE WILL BE PRIZES. 19th August 2015, 2pm AGM, The Regency Inn, Weston-super-Mare. FRIDAY 7TH AUGUST 2015. SEA FRONT COLLECTION AT WESTON-SUPER-MARE. We are holding a teddy tombola again this year after the huge success in 2014. All teddy donations will be gratefully received. This is a good fund raiser for our club so please come along and encourage people to support us by taking part in the tombola. Friends and family are very welcome to come along and help. UPDATE- THE POTTERY CLASSES ARE NOW DISCONTINUED. WE ARE LOOKING INTO ANOTHER VENUE AND WILL KEEP YOU UPDATED. GOOD NEWS! WE HAVE SIGNED UP TO A NEW POTTERY CLASS. UNTIL SEPTEMBER THE CLASS WILL BE HELD ON TUESDAYS, 2PM UNTIL 3PM AT 3 LOCKING MOOR ROAD, WESTON-SUPER-MARE, BEGINNING ON TUESDAY 21ST JULY 2015. THE PRICE IS £5 FOR ONE HOUR. FROM SEPTEMBER WE WILL BE CHANGING THE DAY BACK TO FRIDAYS 2PM UNTIL 3PM. IF YOU WISH TO JOIN THE GROUP PLEASE CONTACT ME ON 07758 839 466 OR EMAIL ME AT aileenotty@gmail.com. UPDATE – OUR TUESDAY CLASSES ARE NOW RUNNING FROM 2PM UNTIL 3.30 PM, £7.50. THIS WAS A REQUEST FROM THE MEMBERS TO ALLOW THEM MORE TIME TO “PLAY AND GET DIRTY”. ALL WELCOME. 1st JULY 2015, 7PM. QUIZ NIGHT, THE YORK HOTEL, WESTON-SUPER-MARE. Please arrive at The York Hotel for 6.30 pm to enable us to be seated for our meal by 7pm. This will allow more time for the quiz questions. Price £5 for meal. This is a fund raising event for EnergEyes and a lotta, lotta fun. Invite friends and family for a great night out. THE ABOVE EVENT IS TO BE HELD AT ST. PETER’S CHURCH HALL, BAYTREE ROAD, MILTON, WESTON-SUPER-MARE BS22 8HG, 7PM UNTIL 10PM.THIS IS ONE OF MANY FUND RAISING EVENTS WE HOLD THROUGHOUT THE YEAR SO PLEASE SUPPORT THE GROUP. THIS ENABLES ME TO OFFER FUTURE EVENTS TO OUR MEMBERS AT A REDUCED FEE. INVITE FRIENDS AND FAMILY ALONG FOR A FUN FILLED EVENING. A BUFFET IS PROVIDED BUT PLEASE BRING YOUR OWN REFRESHMENTS. FANCY DRESS, OPTIONAL. WE ALSO HOLD A RAFFLE AND ANY CONTRIBUTIONS WILL BE MUCH APPRECIATED. SATURDAY 30TH MAY 2015 NOAH’S ARK ZOO FARM, WRAXALL, BS48 1PG. £10, PACKED LUNCH. Travelling by train from Weston-super-Mare to Taunton, catching the service bus from Taunton to Bishops Lydeard railway station. Board a steam train to Watched and return. Spending three hours at the historical harbour of Watchet. WEDNESDAY 22ND APRIL 2015 SING-A-LONG SOUND OF MUSIC, BRISTOL HIPPODROME, 7pm. £8. What a fantastic night was had by all. Laughter from beginning to end and a marvellous film to watch. We are catching the 09.44 train from Weston-super-Mare to Bath. Should arrive back at Weston by 18.01. Come along and enjoy a four night stay at this amazing activity centre on Exmoor. The closest town is Barnstaple. Horse riding, canoeing, abseiling, rock climbing and lots more. Full board, fully qualified instructors and evening entertaining. All this takes place on site in beautiful, peaceful surroundings.Transport will be either train or mini bus and will be extra on top of the £150. Check out their web site at www.calvert-trust.org.uk. Another wonderful day out with the members. Beautiful sunshine and pleasant company. We left Weston on the 08.39 train to Cardiff Central arriving at 10.15. Using booked assistance, which I must point out was excellent, we transferred to another train to take us to Cardiff Queen Street, a three minute journey, where we transferred to another train to take us to Cardiff Bay, another three minutes. After a twenty minute walk we arrived at Techniquest where a hot drink was much appreciated. Lots of fun and laughter amidst the exhibits, most of which were tactile, hands on and challenging. All the staff at Techniquest were friendly and very helpful. A “must do again” trip. This is a hands on science based discover and explore exhibition. More than 120 exhibits. Come along, explore and enjoy with your friends. We will be using trains for this event, an early start from Weston, 8.30 am! Quiz, Wednesday 11th March 2015. The York Hotel, Weston-super-Mare. 7pm £5 for meal. Goalball UK are launching a new club in Weston-super-Mare and are holding a free taster session on Saturday 7th February, 12 until 2pm at the Hans Price Sports Centre, Marchfields Way, Weston-super-Mare BS23 3QP. Come along and “have a go”. M Shed, Bristol, Saturday 24th January 2015. Come along and enjoy our free trip to Bristol’s M Shed museum. Lots of local history, hands on and use of “Pen Friend” speaking tool full of information on each exhibit. We will be using buses for this trip. Packed lunch. Come along and experience this local historical venue. We will be travelling by train from Weston. 6th December 2014. Christmas Fayre, The Winter Gardens, Weston-super-Mare. 10-3pm.This is a fund raising event for EnergEyes and all offers of help would be much appreciated. We will be setting up from 9am. 22nd November 2014. Race Night, The Regency Inn, Weston-super-Mare. 8pm. This is a "fun" fund raising event for EnergEyes. No food provided for this event. 15th November 2014. SS Great Britain, Bristol, £10. Packed lunch. 12th November 2014. Quiz, The York Hotel, Weston 7pm. £5 for meal. Our AGM is to be held at the above venue at 2pm. 23rd October 2014. Skittles, The Regency Inn, Weston-super-Mare. 7pm. £5 for meal. Basket Weaving, RNIB, Bristol. Every Tuesday 2pm until 4pm. £2 per session. 19th October 2014. Sensational Sixties Experience, The Playhouse, Weston-super-Mare, 7.30 pm, 11 seats booked. Weston-super-Mare Sand Sculptures Monday 6th October 2014. Entrance fee £3. 10am until noon. Meet by entrance on Weston sea front. Barnum, Saturday 27th September 2014 2.30 pm Bristol Hippodrome £15 for members.This event is subsidised by EnergEyes. Barnum, The Greatest Showman on Earth. This musical follows the dreams and imagination of America’s Greatest Showman. @bristol. 20th September 2014. An interactive, hands-on experience. Using buses to Bristol. Packed lunch. Saturday 6th September 2014 12noon until 4pm. Tea and Cake event. I plan on attending the morning event and moving on to the event below early afternoon. In-2-Biking at Worle Comprehensive School, 12 until 4pm. A chance to try out some special bikes for the disabled. Side-by-side tandems and lots more. Come along and try one or two of the bikes. Should be a fun afternoon. Refreshments available. 1 until 4pm. Darts, The Regency Inn, Weston-super-Mare. 4th September 2014. 7pm. £5 for meal. Please note this is a THURSDAY. Before we had our meal and played darts Tom and Mike from the Regency Inn took part in an Ice Bucket challenge and raised money for EnergEyes. See photos. £30 was raised for us from the clientele of The Regency Inn. What marvellous support we receive from these lovely, kind people! Let's Hang On, Frankie Vallie and The Four Seasons, Saturday 30th August 2013 Playhouse, Weston-super-Mare £10 each. Canoeing and Archery at Hewish. Friday 15th August 2014. 19th July 2014 St Fagans, The National Museum of Wales - over the bridge and into Wales. You don't need your passport! Transport provided. Come along and join the staff and clientele at The Regency Inn for a fun night out! This is a huge fund raising event for EnergEyes. Invite friends and family to come along and join in the fun! Invite friends and family – dancing, raffle and buffet supper at 8.30 pm – bring your own drink. Pay on the night. Our 3rd Anniversary celebration!! A group of members and volunteers travelled by train from Weston-Super-Mare to Barnstaple on Monday 26th May to enjoy another wonderful five days, four nights at the Calvert Trust, Exmoor. An amazing time was had by all. The weather was kind to us and there was very little rain during our stay. We were able to walk around the lake on a couple of evenings, listening to the birds and viewing the fish activity in the reservoir. Such a peaceful location and stunning views. I plan to take a group to Exmoor next year during April or May. Start saving your pennies if you would be interested in undertaking this very rewarding challenge. A four night, five days visit to the above. £150 per person. Check our the Calvert Trust, Exmoor website for more information on the challenging/exciting event. 17th May 2014 A visit to Weston-super-Mare Fire Station, Milton Avenue. Bus if able otherwise transport arranged. There is a new date for your diary. Saturday 3rd May 2014 10am until 11.30am, £10 each. Get up close with some fascinating raptors with the bird of prey experience, in which you will be able to meet, hold and fly several different species of owls, a hawk, falcon and eagle. Learn all about these amazing animals with this memorable avian encounter lasting 90 minutes. This is followed by a sumptuous Somerset Cream Tea. 7th December 2013 Race Night, The Regency Inn, Weston-super-Mare. 7pm. Come along for a great night out, raise money for EnergeEyes and have lots of fun too. No food provided for this event. A great night at our latest fund raising event. Lots of fun and a very successful fund raiser. A big THANK YOU to Mark and Tom at The Regency Inn for making this event so enjoyable again. The regulars at the Regency made us all very welcome and supported our charity wholeheartedly. The highlight of the evening was when a group of young ladies on a Hen Night came into the pub and joined in the excitement of the races. 23rd November 2013 Christmas Fayre, The Winter Gardens, Weston-super-Mare. A fundraising event. Help very much appreciated from members and volunteers. A couple of hours would be great, thank you. Sponsor forms available from Phillip or Aileen. Should be lots of fun! 26th October 2013. M Shed, Museum of Bristol. Phillip, Jean, James, Ernest, Andrew, Aileen and Spud enjoyed another lovely day out with the club. We travelled to Bristol by bus, meeting up on the Centre and had an hours stroll around the dock side, Queens Square, Welsh Back, St Nicholas Market, Corn Street then made our way to The Watershed. After an enjoyable lunch in a nearby pub we walked to the M Shed on Princess Wharf. A very interesting visit. Most of the members used the RNIB “Pen Friend”, an audio voice pen which reads the information from labels on a number of exhibits. These Pens are provided, free of charge, for the use of the blind/visually impaired who visit the M Shed. On exiting the museum we opted for a trip aboard the Bristol Harbour Steam Train. This travels to The Create Centre and back. Time for tea and cakes! At approximately 4.15pm we made our way back to The Centre to catch the bus home to Weston. Transport arranged to different starting points. A gentle ramble, lunch or a picnic. Meet 10.30 approx. until 5pm approx. Sighted guides. This is a social event as well as a chance to enjoy the countryside, meet new friends and take in some wonderful fresh air. TANSPORT PROVIDED IF NECESSARY BUT THIS VENUE IS ON THE NO.3 BUS ROUTE. TRAVEL ON A STEAM TRAIN FROM BISHOPS LYDEARD TO MINEHEAD FOR LUNCH AND RETURN. £10 EACH. Horse Riding, Urchinwood Manor, Wrington, Somerset. 2pm until 3pm every Monday, £15 each. This event is subsidised by EnergEyes. Transport provided. TRANSPORT PROVIDED IF ESSENTIAL. USE PUBLIC TRANSPORT WHERE POSSIBLE. DRESS CODE – POLO SHIRTS. MEET AT 7PM. £5 FOR FOOD. TRANSPORT PROVIDED IF ESSENTIAL. KYM AND AILEEN WERE INVITED TO THE BBC STUDIOS, WHITELADIES ROAD, BRISTOL ON WEDNESDAY 3RD JULY 2013 TO MAKE A RECORDING FOR THE SECTION “GUIDE”, IN ORDER TO PROMOTE THE RACE NIGHT WHICH IS TAKING PLACE ON SATURDAY 6TH JULY AT 7PM, THE REGENCY INN, LOWER BRISTOL ROAD, WESTON-SUPER-MARE, 7PM. ALL WELCOME. A GROUP OF MEMBERS AND VOLUNTEERS TRAVELLED, BY TRAIN, TO THE CALVERT TRUST, EXMOOR ON MONDAY 24TH UNTIL 28TH JUNE 2013. BELOW ARE THE PHOTOS DEPICTING THE AMAZING ACHIEVEMENTS ACCOMPLISHED BY THIS GROUP OF BLIND/VISUALLY IMPAIRED MEMBERS – VIEW/WATCH AND BE STUNNED! 4TH MAY 2013. 4 X 4 DRIVING, CHEDDAR, LUNCH AND THEN THE BIG DRIVE!! Some of the ladies of EnergEyes having a wonderful night out at a party in the LUSH shop, Bristol. A big thank you to the staff for a LUSH night out!! Two of our members Warren Davies and Mark Ball took part in a new event for EnergEyes members on Saturday 25th August 2012. They had a days’ sailing with CLADS (Chew Valley Association Disabled Sailors). They both had a fantastic day, the weather was very kind to them, a few thundery showers, but all in all not too bad a day for sailing. There are five more Saturdays available for members to take part in this event. The CLADS season finishes at the beginning of October but recommences April 2013. It is possible for only two members of EnergEyes to take part in the sailing on any given Saturday. SAILING WITH CLADS (CHEW VALLEY LAKE ASSOCIATION DISABLED SAILORS). Warren Davies and Mark Ball took part in our first Sailing event on Saturday 25th August 2012 at Chew Valley Lake. As you will see from the photos they both had a fantastic time. This event will be taking place for the next five Saturdays, after which time the season closes. The sailing season begins again April 2013. 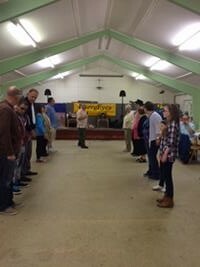 Hi, what a fantastic success our Barn Dance was, financially as well as socially. We have made a clear profit of approximately £700. Wow!! A big THANK YOU to all who attended, the volunteers who helped to sell raffle tickets prior to the event and to all the people behind the scenes who helped make the Barn Dance such an enjoyable evening. What a lot of fun we had!! I will definitely be planning another one for next year! Saturday 18th August 2012 Ebdon Bow Farm, Ebdon Road, Wick St. Lawrence. 7pm until 10pm. Tickets £10 including music and ploughman’s supper. Raffle, fancy dress optional. This is our first fund raising event, please support us! Should be a really fun evening. Yoga class, Clevedon if enough members are interested. A big thank you to the Professionals Mike Hart and Roy Holland for their free time and patience during this event.